This picture and my photography skills do not do this dish justice. 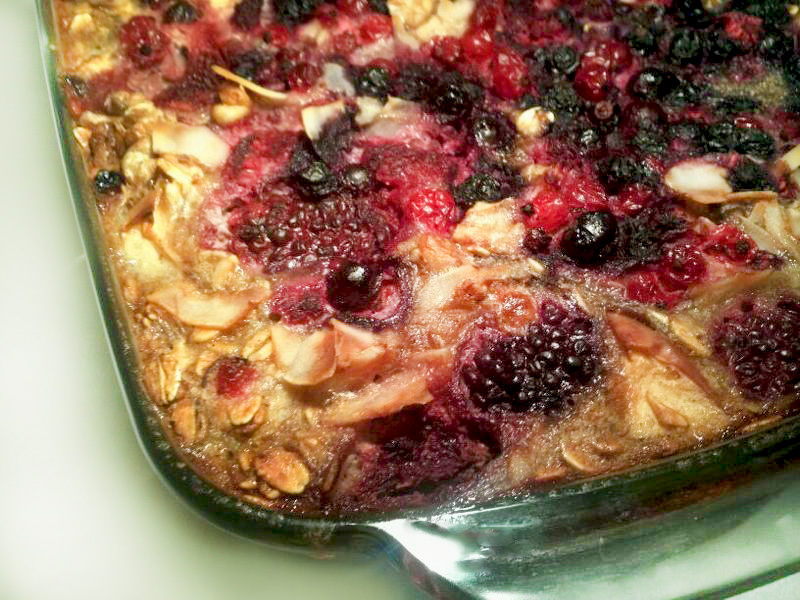 Warm apples, cinnamon, fluffy oats, sweet berries and walnuts. A hint of lemon and coconut. All this with absolutely no refined sugar or added fat. About a bazillion people at work have had birthdays in the last two weeks. Much to my displeasure, this has meant I’ve been surrounded by tempting pastries and baked goods: homemade chocolate cupcakes, cheese danishes, an assortment of glazed doughnuts, cheery turnovers and, last but not least, cinnamon shortbread have been waiting in the office kitchen when I get my tea. As if pressing the hot-water button instead of the coffee button was not enough of a challenge. I have literally taken a knife and cut one of these pastries open just to smell its sugary deliciousness. That’s when I realized I needed something to replace these sweets. A dessert that was sugar-detox approved. My sister pointed me in the direction of a very helpful food blog called Budget Bytes and I made a few adjustments to her recipe to make it “detox” friendly. Best of all, it is hearty enough to have as a breakfast as well! 1. Preheat oven 375 F (190 C). Mash the bananas. 2. In a large bowl, combine bananas, eggs, honey, vanilla, zest, salt, baking powder and cinnamon. Whisk to combine. 3. Add the milk and whisk again until smooth. 4. Stir in the oats, diced applies, nuts and coconut shavings. 5. Spray an 8 X 8 inch baking dish with nonstick spray and then pour in the mixture. 6. Sprinkle frozen berries on top and bake for about 45 minutes or until the top is golden and center is solid. Serve warm or cold, by itself or with milk or whipped cream. Makes for a great breakfast or dessert too! Hi- You mentioned you should bake until golden brown and middlr is solid...how solid? Cake solid when the knife comes out clean? It's pretty similar to most baked goods. The knife method should work. It may not come out completely clean (because of the berries and banana), but you don't want to see any wet batter. I often just push down lightly on the top with a finger or fork to see if it springs back/doesn't sink in. Let me know how it turns out!